Learn how to stabilize Tshirts for a neat, finished look, no more saggy quilts You can adjust any size Tshirt design to fit your quilt plan. 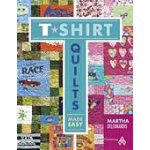 Ten projects plus a gallery full of inspirational Tshirt quilts. 64 Pages.